Quick Pic - What Kinda RV izZAT?? 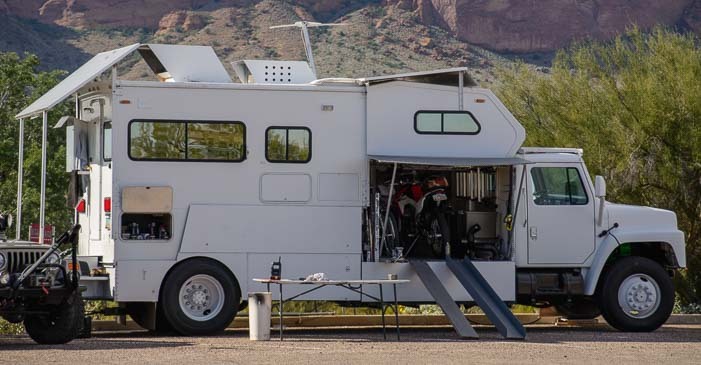 There are so many very cool RVs on the road, and we just love seeing all the variety. Lately, we’ve been eyeing up a particularly unusual one that has been parked near us. Yesterday, I had a chance to talk to the owner, Stan, and what a great story he had to tell. Growing up on a farm, Stan dreamed of more distant horizons. At age 35, he left the family farm for a life of adventure. Taking a big manure spreader truck and an old truck camper that had been lying around the back of a barn, he put the two together to create a terrific rolling home. Now 73, he has been living in it on the road ever since — some thirty-eight years!!! Now THAT’s a long-term full-time RVer!! Stan is very handy and has given his home many upgrades over the years. Today it sports 1,200 watts of solar power (holy smokes!) and a whopping 600 gallons of fresh water!! Hookups? Are you kidding? Never!! Free to roam, Stan has ridden his mountain bike and dirt bike all over some of the most remote dirt roads of the west. “If you live this way, you’ll live forever,” he told me with a carefree smile. Yes, indeed!! 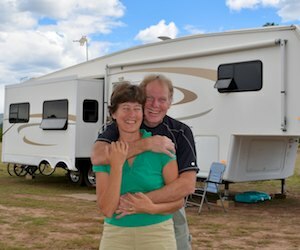 You don’t have to spend your cherished nest egg on a luxury Class A to have a little fun and find some independence in the full-time RV lifestyle. Just grab an old truck and camper and take off! Sisters on the Fly – Vintage Gals in Vintage RVs! World Cruising Done Right – All the Benefits of Cruising without the Hassles! This entry was posted in Quick Pics and tagged Full-time RV Lifestyle, Quick Pics by Roads Less Traveled. Bookmark the permalink.